Thank you for visiting this eBook tutorial. We now have an eBook design startup—BB eBooks—dedicated to helping independent authors and small presses get their eBooks formatted, converted, and ready for sale at all the major online retailers (e.g. Amazon's Kindle Store, Barnes & Noble's Nook, iBookstore, Smashwords, etc.) Please contact us for a no-obligation quote. For those writers, editors, and publishers looking to go the DIY route for eBook production (you probably are if you visited this page), we offer free online tutorials and apps to help you professionally design your eBook. Please visit our Developers page and let’s work together to improve the overall standards of eBooks. Also, please sign up for the mailing list for promotions, design & marketing tips, plus eBook industry news. Warning This Content is Out of Date. Please head on over to the BB eBooks Developers Page for the most up to date information on eBook creation. So, this is it. This is the final step toward having your eBook available for sale to the international marketplace of readers. For publishing on the Amazon.com Kindle store, you will need a MOBI file. For publishing on the Barnes & Noble NOOK store, you will need an EPUB file. Finally, for publishing on Smashwords, you will need a clean .doc file. Please consult the eBook formatting tutorials for MOBI/EPUB and Smashwords for further assistance. This guide does not cover how to market your eBook, which is the hard part, but there are a lot of great authors who provide free advice on the matter, such as Lindsay Buroker, Stephen Knight, and Dean Wesley Smith. The Amazon Kindle store, Barnes & Noble NOOK, and Smashwords have very author-friendly methods toward placing your eBook on the market. This is of course because they get royalty payments on every copy that is sold, so they would be lousy businesses if they made the process difficult for the self-publisher. You can self-publish to the Amazon.com Kindle store through the Kindle Direct Publishing platform. Barnes & Noble uses the PubIt platform (US authors only). Finally, Smashwords uses their Meatgrinder and Autovetter system. One additional tool that may come in handy as you self-publish is the eBook Publishing Quick Reference Guide by Gary McLaren [free]. He also has a freebie entitled The Beginner's Guide to eBooks, which discusses various eBook formats from a reader's perspective. Pricing: Pricing strategy is an important aspect directly related to marketing. Smashwords allows you to distribute your eBook for free or at any price that has ".99" at the end of it in US Dollars. Amazon.com and Barnes & Noble do not allow you to distribute your eBook for free, and the lowest you can go is $0.99. However, if you make your eBook free at Smashwords, the Amazon.com Kindle store and Barnes & Noble NOOK may decide to make your eBook free. The process is a bit finicky, but it has worked for others. Royalties vary depending on how you price your eBook. Taxes: Like death, taxes are completely inevitable, especially with the United States Government going more into debt by the day. US-based authors need to provide a Social Security Number for tax reasons, and Amazon will withhold some of your earnings. Amazon and Smashwords require international authors to obtain an Individual Tax Identification Number (ITIN). Like most bureaucracies, it takes 6-10 weeks to apply for one by mail with the United States Internal Revenue Service (IRS). The author of this guide applied for an ITIN on behalf of his Thai wife, Lisa, and her passport came back with water damage all over it. Important Note: You should apply for only one ITIN. Depending on your country of residence, Amazon.com may not withhold your earnings from sales (nominally 30%) based on existing tax treaties. Consult the Amazon.com FAQ for more details on how taxes work for self-publishers. The complicated tax structure in America has made Barnes & Noble NOOK reluctant toward allowing users from outside the USA to self-publish using the PubIt platform. Supposedly, they will be opening up the NOOK store to authors from outside the USA soon, but it has been slow. Metadata: Even though you embedded metadata into your EPUB and MOBI files, you still need to add the metadata online when you self-publish your work. This guide recommends having a set of keywords and your eBook's description ready for exactly how it will appear on the Amazon, Barnes & Noble, and Smashwords sites. Do not overlook your eBook's description, as this blurb is what the reader will see before making the decision to purchase or sample. It is also important so that readers know your book exists as they perform searches. Cover Images: Cover images are also important to have ready when uploading your eBooks to the international marketplace. Even though the cover images were embedded inside your MOBI and EPUB eBooks, you still need to upload the JPEG file. 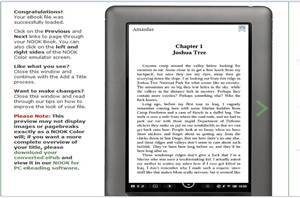 A good rule of thumb is to use a 600x800px image for the Amazon.com Kindle store, 547x730px image for the Barnes & Noble NOOK, and 600x800px image for Smashwords. You can publish an eBook on all these sites without a cover image, but it is strongly discouraged. Sales: All of these sites have comprehensive methods to track your sales on a very responsive basis. The only exception is the Smashwords sales that take place at the markets they distribute to (e.g. Kobo, iBookstore, etc. ), because those markets report sales to Smashwords on a delayed basis. However, do yourself a favor and don't check it more than once a day. You will drive yourself completely mad. ISBNs: It costs you absolutely nothing to use Kindle Direct Publishing, PubIt, and Smashwords to self-publish. Additionally, you do not need an ISBN for these three splatforms. ISBNs are automatically assigned by Smashwords when distributing to markets that require them (e.g. iBookstore). Copyright: If you wrote the eBook, you have the copyright. You do not need to register this with the United States Government, which is where Amazon.com, Barnes & Noble, and Smashwords are based. This is the law. The moment you type your own original work, you have the exclusive copyright, because the law actually works in your favor. Consult Passive Guy if you need legal services with regards to copyrights. He is a lawyer with a lot of knowledge and experience in this area, and he can help authors at a reasonable rate. DRM: Digital Rights Management (DRM) is a terrible, no-good way to discourage piracy. Not since Crystal Pepsi have consumers so universally hated something foisted upon them. Smashwords is philosophically opposed to DRM and does not allow it for any of the eBooks sold on their website. When you upload to the Amazon.com Kindle store and Barnes & Noble NOOK, you have the option to use or not use DRM. You should strongly consider not utilizing DRM in your eBooks, as a courtesy to your readers. Instead of creating unnecessary hassles for the customer and fretting about someone downloading a torrent of your eBook, which will happen whether or not you use DRM, you should focus on impressing your customer and using a pricing strategy that maximizes distribution. Amazon has the Kindle Direct Publishing (KDP) platform that you need to register with before self-publishing. They have a Frequently Asked Questions (FAQ) section that covers every inquiry you probably have about royalties and practicalities. The only thing that is terse is the formatting section, but since you have these tutorials, that is not an issue. Once you have setup a KDP account, add a new title from your dashboard. The process is very straightforward, and there are help pop-ups for everything you have to fill out. You only get to choose seven keywords, so make them count. Also, make sure that you don't check the option to make your eBook public domain. This means you don't have any rights to the eBook. The important step is when you upload your MOBI file. You will have the opportunity to "Preview book", which pulls up a miniature Kindle app in your web browser. Click through the sections and make sure that everything looks the way it did in the Kindle Previewer. You may notice that the text goes right up against the edge with no margin. This is actually what you want, because the Kindle has a built-in margin that does not appear on the "Preview book" function. There is a section where you set the price, and you cannot get the 70% royalty unless you set a minimum of $2.99. Any pricing below $2.99 will only yield 35% royalties. You will also have the opportunity to enable lending, which allows Kindle readers to lend your eBook to someone else for a 14-day period. At this time, Amazon.com only allows readers to sample the first 10% of the eBook's content for free. This is unfortunate, since most readers like to sample more of an eBook before they buy it. Once you have finished updating your information, it takes approximately 24-48 hours before your eBook is live in the Kindle store. Be mindful of this delay if you plan on a specific date for an eBook launch. It is also advisable that you maintain an Amazon author page to tell readers a little about yourself, which will be linked to the product page of your eBook. Barnes & Noble began PubIt following the success of Amazon.com's Kindle Direct Publishing platform. It is essentially the same concept as KDP, and it allows indie authors to self-publish with ease at the NOOK store. The royalty structure is similar to Amazon: 65% for any eBook sales $2.99 or above and 40% for any sales under $2.99. Registering an account on PubIt is a very straightforward process, and the FAQ section is helpful. At this time, you can only register on PubIt if you have a US tax ID (Social Security Number, ITIN, EIN, etc. ), a US credit card, and a US bank account. On the PubIt dashboard, click on "Add a Title". Everything in there is self-explanatory; however, keep in mind that you will need to add an author biography for every eBook you upload. When you upload the EPUB file, it will automatically go to a mini-NOOK preview screen. Spend some time to verify that your EPUB is showing up correctly. Once you have uploaded your EPUB, expect it to go live in about 3-4 days. Obtaining an account on Smashwords is simple and open to the international community. However, publishing on Smashwords requires some additional attention, because you have to troubleshoot how your .doc file gets processed through the Meatrgrinder. Your first attempt through the Meatgrinder will most likely have some wrinkles to iron out. To publish on Smashwords, sign in and click on the "Publish" tab. You will need to enter some metadata to include a short (<400 characters) and long (<4,000 characters) description. The cover image is required to obtain access to the Premium Catalog, and a 600x800px JPEG is recommended. You will be able to set the pricing for your eBook on this page, but it must be free or have a "$.99" affixed at the end due to the pricing policy on the iBookstore. In regards to the formats, you have the options of making your eBook available as an EPUB, LRF, MOBI, PDF, PDB, RTF, and TXT. You should maintain the default of having the Meatgrinder convert to every available format. For some reason, uploading your .doc file with Firefox produces a strange error on the Smashwords site. If you are having problems uploading in Firefox, try using another web browser (e.g. Internet Explorer, Safari, or Chrome). After you press "Publish", your document gets put through a queue in the Meatgrinder. In the past it took hours, but now it only takes 5-10 minutes to get all of your formats processed, depending on the time of day you are uploading. After the eBook shows up on your Dashboard, you can view the product page and download all the files for troubleshooting the Meatgrinder conversion. The files will be immediately available to the public for sale on the Smashwords site. You will receive a notification on the Smashwords Dashboard that you have to assign your eBook an ISBN. Follow the instructions that Smashwords provides, and they will assign you a free ISBN that can be used only for Smashwords. Autovetter errors: Within an hour, you will receive a lengthy form-generated email from Smashwords talking about your eBook being available online. At the bottom of the email, it should say if there were any Autovetter errors. Fix your .doc source file if you have any issues, because you need to have no errors to gain Premium Catalog distribution status. Now that all the formats have been processed through the Meatgrinder, it is necessary to verify them. 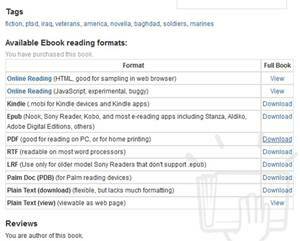 The most important format is the EPUB file, because it goes to most of the retailers (e.g. Barnes & Noble NOOK, iBookstore, Sony, etc.) 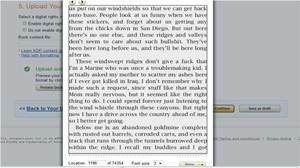 You can use Adobe Digital Editions to inspect the EPUB on your PC. It also advantageous to validate the EPUB, just to be sure. There are always going to be one or two problems on the first pass through the Meatgrinder. You can adjust your source .doc file, and re-publish in your dashboard by clicking "Upload New Version". It will once again go through the Meatgrinder queue and create entirely new formats. As Smashwords advises, do not publish the same eBook more than once. Erroneous page breaks: Try using the pagination features in Microsoft Word on your Heading 2 style. Erroneous margins: Verify that you have set the correct spacing values in the Style Menu in Microsoft Word on each of your styles. Also, check to see that you have not accidentally declared the wrong style in each paragraph. Finally, make sure you do not use tabs anywhere in your .doc file. Faulty NCX Table of Contents: Inspect the bookmarks in your .doc file to ensure that they are located in the correct place. When inserting a bookmark at your headings, try clicking the cursor in the middle of the heading's text, and then insert the bookmark. It is recommended that you do not select the entire heading, as this can cause bugs during the Meatgrinder conversion. You should consult the Smashwords Style Guide for detailed troubleshooting, and don't be frustrated if it takes a few times to get it right. Premium Catalog: To gain access to the Premium Catalog, a Smashwords team member has to look over your eBook. While this is ongoing, your eBook will say "Pending Review" under the dashboard. The review process takes about one week. If there are any problems, you will be notified via email. You should endeavor to gain access to the Premium Catalog, because that will allow your eBook to ship to all markets. Once it is approved, your eBook will say "Approved on mm/dd/yyyy". Important Note: For the Premium Catalog, you need to make sure that you have no links to Amazon.com. Otherwise, you get an Orwellian message saying that other eBook retailers do not like to know that Amazon.com exists. It is advised to not mention Amazon at all in your Smashwords .doc source file. Great post! With the introduction of the Kindle and other small e-readers the market for electronic books has sky rocketed. There never has been a time like this for would be authors and editors. This is the best no cost way to build up a reliable recurring monthly income.